Documents obtained from the cities of Laurel and Hagerstown reveal that a requirement of state law that speed cameras be certified by an independent calibration lab was circumvented, with the cities and their contractor allowing the manufacturer of the devices to certify their own equipment. Both Laurel and Hagerstown contract with Brekford Corp for speed camera services and hardware. A motorist filed a public information act request with the City of Hagerstown seeking evidence for their defense for a March 4 hearing, sending it to the address shown on the citation. The request was delivered on January 30, however the city did not respond until March 7 (which was not within the 30 day time period required by the MPIA), claiming in their response that the request had been received by the contractor and not delivered to them until Feb 18. 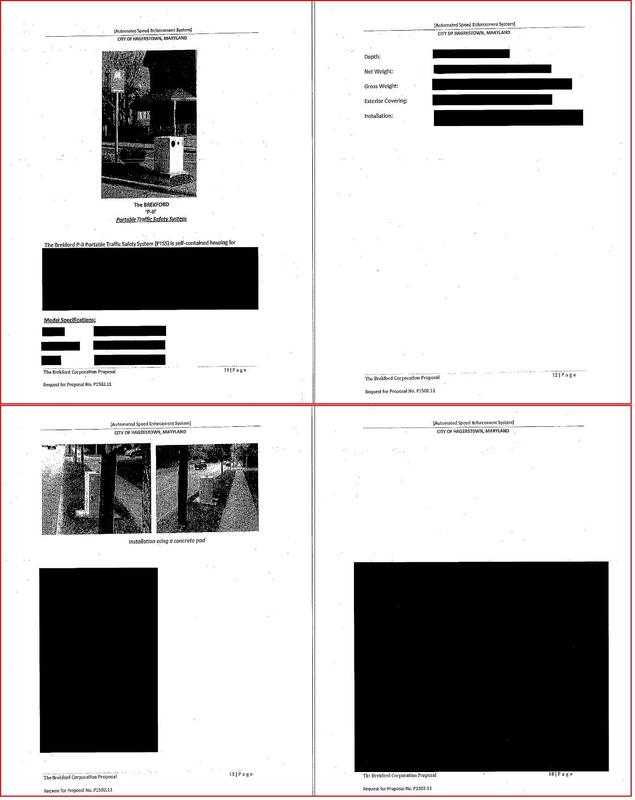 Brekford Corp's Idea of "Transparency"
The request included the technical specifications of the speed camera and the annual calibration certificates. Hagerstown provided a technical specifications document WITH ALL TECHNICAL INFORMATION DELETED. Even the make and model of the device were removed, along with all citation approval procedure information. The city asserted that the document contained "materials considered trade secrets or confidential commercial or financial information". In addition, the city did not provide the annual calibration certificates, stating that they were in the custody of Brekford corp and to request the documents in writing from them (this is despite the fact that the city's reply stated that the motorist's MPIA request was originally received by the city's contractor ). As a result, the motorist did not receive any of the documents she was seeking prior to her court hearing and was denied the opportunity to use them to prepare a defense. 2. Shall be admitted as evidence in any court proceeding for a violation of this section. We argued that it would be illegal to run a speed camera program without the annual calibration document "on file". On March 15 the city "found" the missing certificate and sent a new response to the requester: "it was determined the calibration certificate records are on file, and we are producing them along with this correspondence." The documents reveal the "certificate of verification" was issued by "Sensys Traffic AB" : the Swedish manufacture of speed camera equipment used by Brekford Corp. The document did not show the actual standard being tested against, only that it "is verified according to Sensys In-house Verification method" and that "The device under test was in compliance with specification at all tested points". The "customer" was listed as "Sensys America", the US distributor for Sensys whom Brekford contracts for speed camera hardware. The city still did not provide a non-redacted technical specification. Had the documents been made available to the motorist prior to her court hearing, she might have asserted that the manufacture of a device does not meet the definition of an "independent calibration laboratory", since they have a vested interest in declaring their own hardware valid, and that the city did not meet the burden of proof because the specified document was not "admitted as evidence in any court hearing" as state law requires. At nearly the same time this was taking place, the Maryland Drivers Alliance placed a public information act request with the city of Laurel for copies of all of their annual calibration certificates used during any portion of 2012 or 2013, and a technical specification for the devices. Laurel refused to provide technical documents, claiming that it was proprietary information belonging to Brekford Corp. However on March 13, 2012 Laurel did provide calibration documents for 6 speed camera locations. 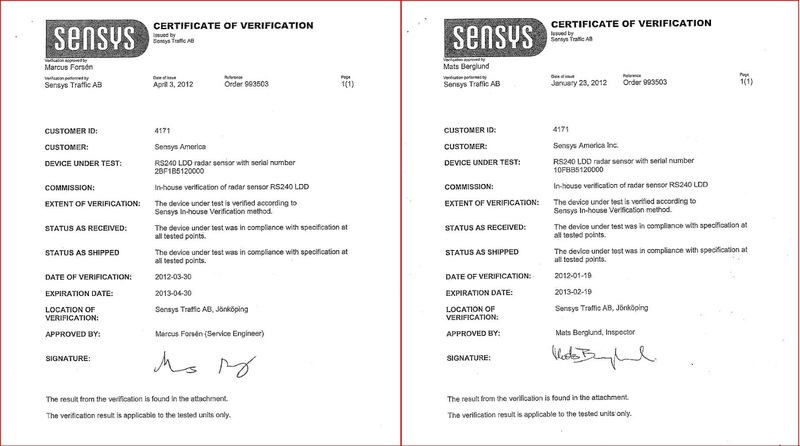 All calibration certificates issued prior to November 2012 were issued by the manufacturer, Sensys. 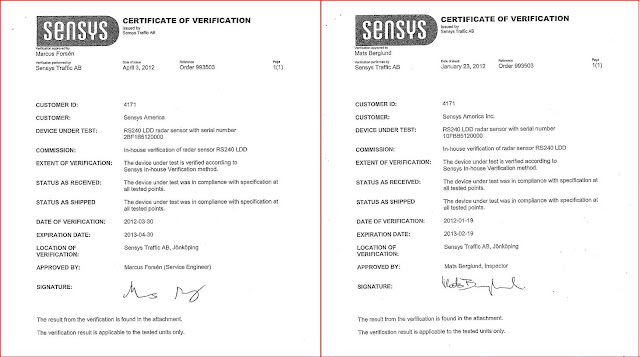 One location had two certificates, one issued in November 2011 and a second one issued in March of 2012, showing different serial numbers but both verified by the manufacturer of the device. We note that several of the certificates were past their expiration dates at the time they were provided. And as a side note, several the certifications had expiration periods of 13 months, not 12, and as such were not actually 'annual' checks as state law specifies. The tests were performed in Jönköping, Sweden, and as such the devices were shipped across the Atlantic and probably transported one or more times within the US after the manufacturer's calibration check took place. Only two documents, issued in November of 2012, were issued by an apparently genuine independent lab (the Radar Lab of Maryland). The city had also provided an earlier version of the certificate for a camera on "Montgomery Street" that was issued by Sensys corp (the manufacturer) on April 6, 2011 with an "expiration date" of of May 8, 2012. It is unknown at this time whether this device was operating during the six month period during which the former certificate would have been "expired" before the new test was performed. Another camera, on Van Dusen NB, had a certificate issued by Sensys in November 2011 expiring in November 2012. A new certificate was issued by the Radar Lab of Maryland on November 2, 2012. This situation with Laurel and Hagerstown is similar to an earlier example where the SHA's contractor, ACS (now part of Xerox Corp), allowed the manufacturer of equipment used by the SafeZones Program to be certified by the manufacturer of the devices for the first 9 months of their program.. The SHA's devices were re-certified after the matter was brought to the attention of a state senator who informed the SHA that such a practice "wouldn't fly". This was similarly done in Baltimore County and Baltimore City until after the situation was exposed in 2011. The matter was raised in a recent SHA audit critical of the SafeZones Program. The Audit explained the SHA's rationale: "SHA’s position is that neither State law nor the contract specified the timing of the annual independent certifications and, consequently, the certifications obtained beginning in March 2011 satisfied any legal or statutory requirements." The SHA's explanation is fatally flawed because the certification documents are required in court. It is also bogus because it would potentially render the requirement of the law meaningless. 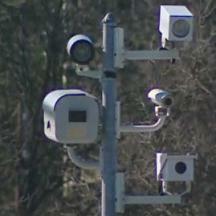 If a speed camera were not required to be certified until after a full year of operation, then if a problem were discovered they could quietly re-calibrate or repair the hardware,test it again, and take no action towards the thousands of citations already issued with the improperly calibrated equipment. A contractor could possibly even swap in new hardware each year, and thus NEVER perform an independent check at all. In Laurel's case, the city had been running a speed camera program for 2 years by the time the first "independent" certificates we were provided were issued. As such it appears that even if the SHA's explanation were valid, it still might not fly in Laurel's situation. Hagerstown's speed camera program produced nearly $1 million in revenue in its first 8 months. Document's provided to us by the Comptroller's office show that Laurel reported receiving $1,553,081 in speed camera revenue in the fiscal year from July1,2010-June 30, 2011, but indicated that they had not provided a required report of their speed camera revenue to the comptroller for FY2012 as of the end of 2012. Brekford Corp recently replaced Xerox Corp as the vendor for Baltimore City's speed camera program at the beginning of 2013. Baltimore's program has been under intense scrutiny since systematic errors were discovered last year while Xerox was running the program, which might temporarily discourage the short-cutting of rules such as this one in that particular speed camera program. Brekford Corp is also the speed camera vendor for Morningside, Salisbury, Landover Hills, Capitol Heights, Fairmont Heights, and Cheverly. The mission of the Maryland Drivers Alliance is to protect the rights of Maryland drivers. We oppose programs and fees which treat motorists as cash cows or which do not give proper consideration to the interests and rights of the driving public. The Maryland Drivers Alliance opposes the corrupting effect which automated enforcement has on our justice system. Our activities have helped to exonerate literally thousands of motorists from erroneous or wrongfully issued speed camera tickets. The spotlight our efforts have placed on corrupt or incompetent local government photo enforcement programs has forced agencies to be more transparent and less unfair in their treatment of motorists. We support responsible enforcement of traffic laws by human officials and the proper application of traffic engineering principals to improve safety. We believe drivers should always make safety their first priority. This site is not for profit and is run entirely by volunteers. Unlike the speed camera companies and their local government clients, we don't want your money. Baltimore Calls for "Media Restraints"
Montgomery Scamera Boss Lies About Red Light Camera "Warning Flashes"
Salisbury Records Show Calibration Lapses, Sorry No Refunds!! Attorny General Gansler Depicted as "Reckless Passenger"
Montgomery County Boasts Error Rate "Under Ten Percent"
Do you agree with Governor Hogan's new Express Toll Lane plan?